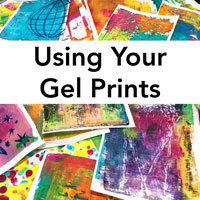 Previous post: Can You Use Acrylic Gouache on a Gel Plate? 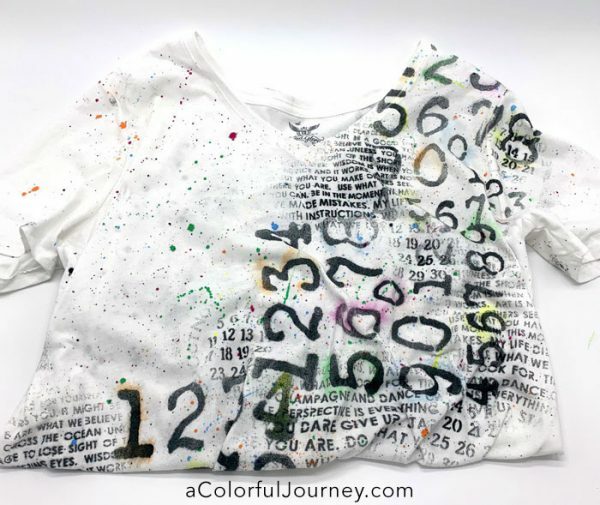 How would you like to turn a cheap plain t-shirt into something artsy & one of a kind? 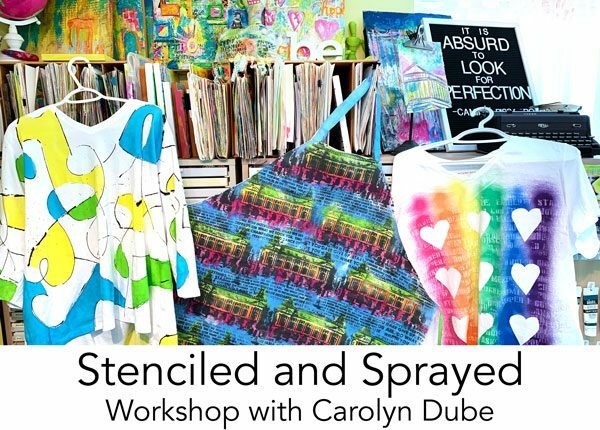 Join me for Stenciled and Sprayed where you will be turning shirts, aprons, canvas totes, heck, anything fabric or cloth you want to bring, into works of art. The most important thing that you will experience during the day is FREEDOM. The freedom to play. To let loose. The exhilaration of releasing your creative impulses. That’s the long lasting joy of creating. As you play, I’ll be there to guide you and answer all your questions. ZERO experience needed! 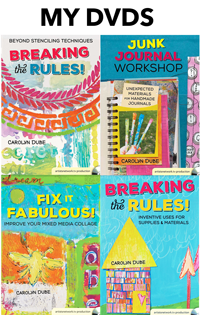 Here’s just some of what will be covered as I break it all down step-by-step. What will we be using? 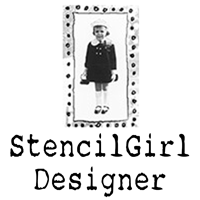 Marabu Fashion Spray and StencilGirl stencils – all provided for you! In fact, any of the special supplies, I’m bringing so you can pack light. 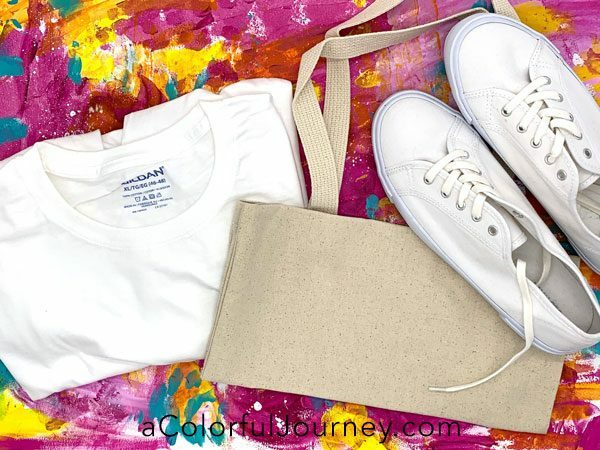 4-6 plain (white or light colored) fabric items you’d like to art up. 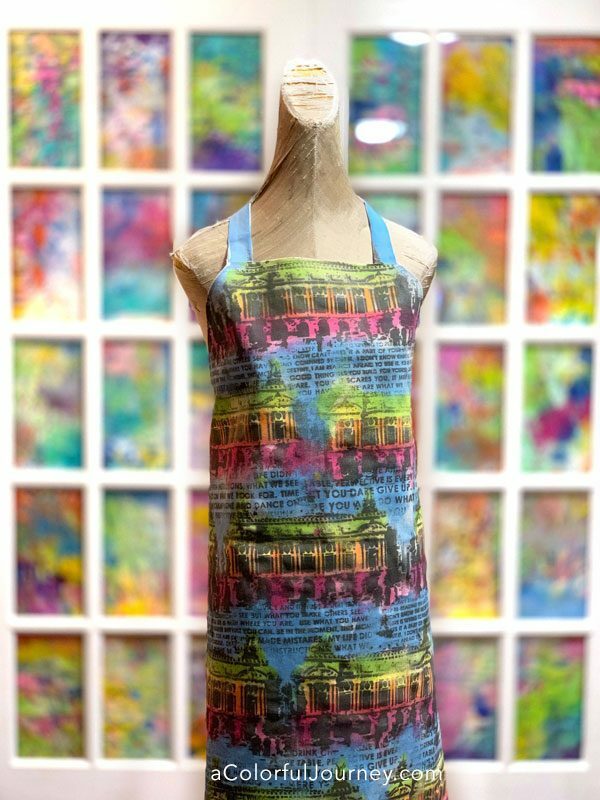 What can you art on? Anything that is white or a very light colored fabric. These items will be your blank canvas for our day of play together. Does it have to be all cotton? The more cotton there is in it, the better it takes the color. The “proper” amount is no more than 20% synthetic but I do 40% all the time because I buy very inexpensive t-shirts and they have held the color well. I’ll explain how to set the color the easy way during our day together too. How much should you bring? Bring at 4 -6 items like t-shirts, button-down shirts, skirts, aprons, canvas totes, canvas sneakers, fabric, or anything else you’ve got. Where can you get these? First, look in your closet. White shirts with stains on them are great to use, that spaghetti stain will be completely covered up! Next, check out thrift stores, craft stores, Target, online, anywhere you like to shop for white fabric items. 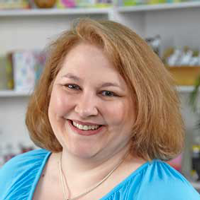 This is a day of pampering because Glenda Miles is our host extraordinaire – she knows how to take care of us so we can focus on the fun! Your lunch is included as well as munchies during the day from the Mockingbirds Cafe. When and Where? 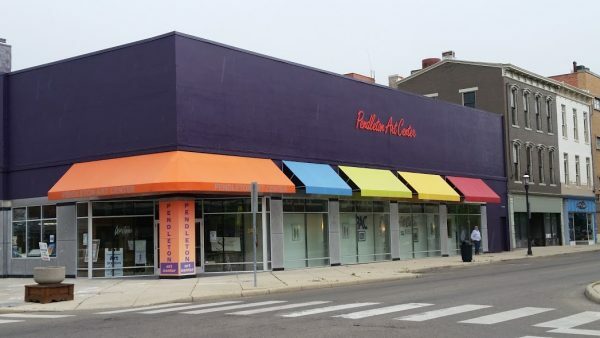 10am-5pm on Saturday, April 6, 2019, at the Pendleton Art Center in Middletown, Ohio. One of the many reasons I love this place is the amount of space we have. It’s big, like roller rink big, so that means you have plenty of space! Plus during lunch, there are art studios to explore. 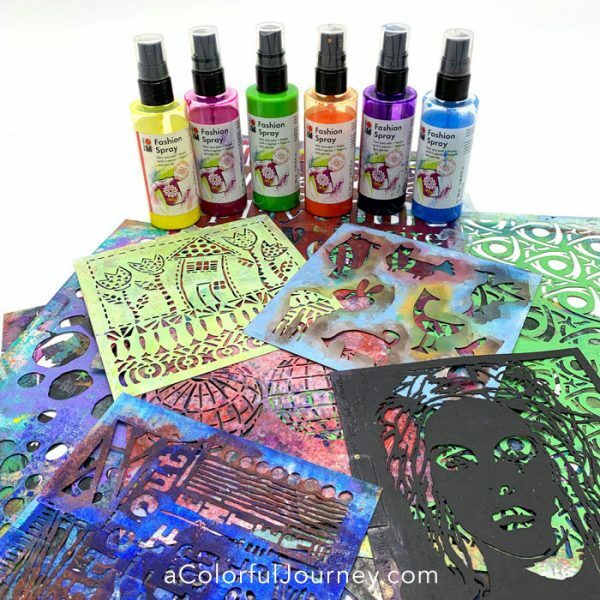 Cost: $130 that includes refreshments & treats AND your lunch from Mockingbirds Cafe, all the specialty supplies including all the Fashion Spray and use of StencilGirl stencils, and your take-home goodies like my secret weapon of an applicator. 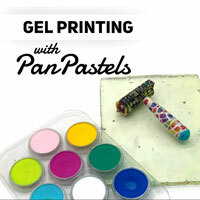 Come join me for the day and feel the freedom of play as you create colorful wearable art! 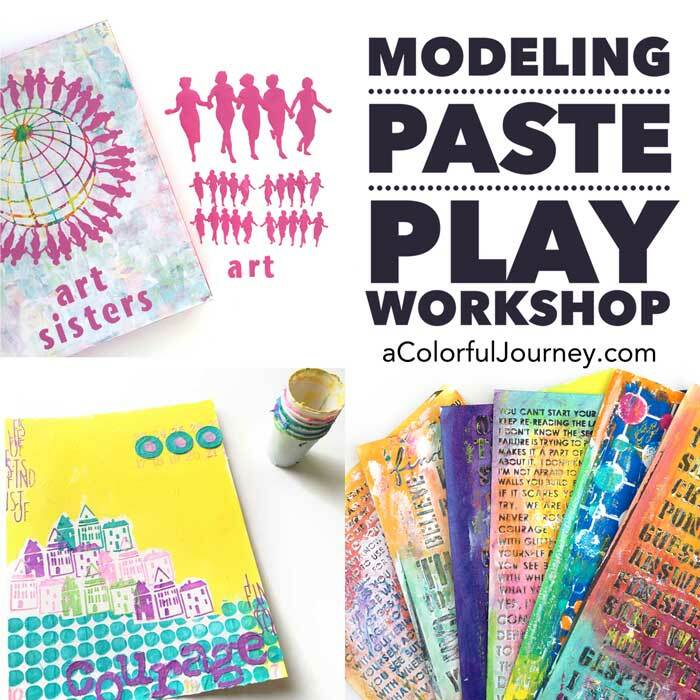 Get registered here and get ready for a day of creative play! That’s going to be the best class. Congratulations!!!! I’ve signed up! Already pulling together stuff — I have a white (!) backpack I bought at Michaels a couple summers ago intending to decorate it. I think this class fits the bill for it! I’m glad I didn’t do anything to it . . .